On wednesday afternoon i had the opportunity to watch a great film on the big screen: East of Eden. Thanks to the art cinema in Århus, which opened its renovated rooms and cafes, welcoming movie lovers with the free exhibition of four movies, including East of Eden – or Øst for Paradis in danish, which is how the art cinema is called, since its first opening in 1978. There was cake for everyone before the film, and free wine and a buffet by the end of the exhibition. The only unpleasant thing was the heat in its interior, as it’s a charming and old styled cinema, with no air conditioning. 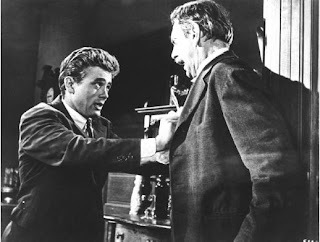 East of Eden was the first big role James Dean played in the cinema. And in my opnion, his most well-portrayed role. When the new generations think of Jimmy, they immediatly picture the red-jacketed teenager in Rebel Without a Cause, but i like to remember him as the misunderstood young man who only wanted to be loved by his father. In the Elia Kazan film, based on the John Steinbeck’s novel and set in America just before the First World War, Dean plays Cal Trask, one of the two sons of an old lettuce farmer. The other kid, Aron Trask, is daddy’s favorite, while Cal has always been left out. Their mother abandoned them in a very young age, leaving the two young children (babies, perhaps?) in the care of the strict; bible-reader; moralistic and self-conscious, though, good-hearted man. Their father made up a story that their mother had died when they were young, something Cal would find out as being a lie many years later, in the first film scene. The woman, Kate (Jo Van Fleet, who won an Oscar for this role), runs a brothel not far from the town where her abandoned family lives. Cal, desperate for comprehending who he is, tries to seek on her mother’s figure the explanation for his “bad” personality. Many critics use to say this story is a modern version of the bible tale of Cain and Abel, which makes quite sense, but i refuse to see James Dean’s Cal as a cold-hearted, envious and evil brother. Not only the character’s actions, as the way Jimmy portrays him, helps the audience to conclude nothing but the fact that Cal is the opposite as a modern Cain. James Dean has never been so vulnerable on his short career on screen. And it’s clear that his real life inspired him to portray such a character, as Dean’s father never really cared for him. On his portrait in this film, the acclaimed movie critic Pauline Kael wrote: “As the romantic, alienated young hero, James Dean is decorated with all sorts of charming gaucheries; he’s sensitive, defenseless, hurting. Maybe his father doesn’t love him, but the camera does, and we’re supposed to (…).” I don’t really know if she was true or ironic in this statement, but from the review, she seemed to have loved the film. I find this particular scene, one of the most powerful scenes in the whole film. I won’t describe it here in order to not spoil it to the ones who haven’t seen this must-see film.